Set consists of one lightweight precision handle and four interchangeable tools. Can be used for manipulating micro samples, scribing, spring assembly, and probing. The handle is finely balanced, non-rolling gold anodized with split collet and a knurled lock nut. The length is 120 mm (4.7"). Precision forged and ground tools are hardened and nickel plated tool steel with sharp tips. These unit measuring scales may be used directly under a microscope or magnifier for quick measuring of small specimens, parts, grooves, slots, line widths, holes, chambers, etc. Precision fabricated from stainless steel, the scales are welded to bendable stainless steel shafts and mounted in color coded, non-rolling handles. Each scale is individually packed in a plastic tube. Overall length of the scale is 83 mm (3¼"), including handle. This high precision pin vise handle is machined from the finest material, nonrolling gold-anodized aluminum, which makes it lightweight and versatile. It comes complete with a precision drawbar for positive collets chuck clamping. It features an 8mm (0.31") hexagonal barrel dimension by 100 mm (4") long (overall length is 115mm fully assembled) and it has a knurled finger-grip for positive precision control for handling and tool manipulation. The vice is supplied with a standard collet chuck opening of 2 mm (0.78") diameter and will hold a selection of our specially designed tools - and collets adapter 0.8mm (0.003") for diamond stylus chucking. 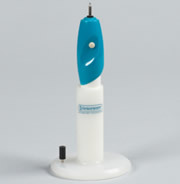 This diamond stylus is perfectly suited for the Thermo Scientific PrintMate and MicroWriter, RA Lamb and TBS Shurmark microscope slide labelers. Manufactured with a consistent even coating of diamond dust. 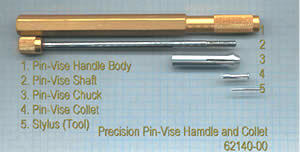 The 2.35 mm shaft is made from stainless steel. A Swiss made saw frame lightweight and perfectly balanced. Its ergonomic wooden handle reduces fatigue and provides greater dexterity. Patented blade-lock design eases blade insertion and maintains perfect alignment which eliminates wobble and reduces blade loss during use. It measures 2¼" (70 mm) deep and accepts saw blades up to 1.2 mm diameter and 130 mm long. This Saw Frame may be used ideally with the Diamond Wire and Spiral Saw Blades shown below. Precision etched, non-glare ruler made from surgical stainless steel, only 3 mm wide. The ruler is calibrated in 0.1 mm graduations, 10 mm total range. Stainless steel handle 230 mm long. Balanced and angled for the ultimate in flexibility able to reach into areas which are impossible for other measuring devices. Made from hardened steel, this tool has three razor sharp cutting edges ranging from a very sharp point to one that is approximately 10mm in length. These nickel plated triangular tools are mounted in red and black plastic handles. Tool length is 30 mm by 2.1 mm across (1.2" x .08"). The overall length of the tool is 154 mm (5.7").2 tools/set. This precisely ground sapphire blade is 1.5 mm x 2.3 mm, 14 mm long (0.06 x 0.09 x .56"). It is permanently mounted in a hexagonal gold anodized aluminum handle. Total length is 120 mm (4.75"). 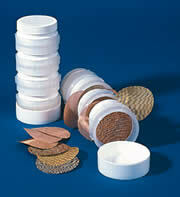 A set of 8 phosphor-bronzed screen inserts in the following sizes: 25, 35, 45, 60, 80, 120, 170, and 230 mesh. These precision hand held tools can be used for scoring and cleaving all types of optical fibers. A ground and polished natural diamond which has a v90 degree included angle with a relief angle of 30 degrees. The cleaver is retained in a quality metal pen like casing with a pocket clasp. The diamond part is 1.5 mm wide x 3.0 mm long. The overall length is 133 mm.